The antibody detects endogenous levels of total SNAP91 protein. Small volumes of anti-SNAP91 antibody vial(s) may occasionally become entrapped in the seal of the product vial during shipment and storage. If necessary, briefly centrifuge the vial on a tabletop centrifuge to dislodge any liquid in the container`s cap. Certain products may require to ship with dry ice and additional dry ice fee may apply. Clathrin coat assembly protein AP180 is a protein that in humans is encoded by the SNAP91 gene. Adaptins are components of the adapter complexes which link clathrin to receptors in coated vesicles. Clathrin-associated protein complexes are believed to interact with the cytoplasmic tails of membrane proteins, leading to their selection and concentration. Binding of AP180 to clathrin triskelia induces their assembly into 60-70 nm coats. 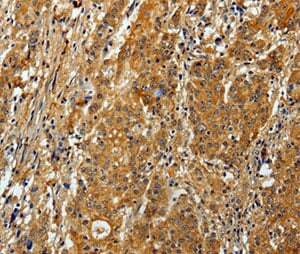 Immunohistochemical analysis of paraffin-embedded Human gastric cancer tissue using at dilution 1/20. 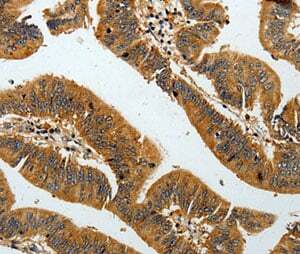 Immunohistochemical analysis of paraffin-embedded Human colon cancer tissue using at dilution 1/20. NCBI/Uniprot data below describe general gene information for SNAP91. It may not necessarily be applicable to this product. SNAP-91: Adaptins are components of the adapter complexes which link clathrin to receptors in coated vesicles. Clathrin-associated protein complexes are believed to interact with the cytoplasmic tails of membrane proteins, leading to their selection and concentration. Binding of AP180 to clathrin triskelia induces their assembly into 60-70 nm coats. 3 isoforms of the human protein are produced by alternative splicing.